Spencer Ante has been writing about technology, business and culture for more than 12 years. He is currently Deputy Bureau Chief of the New York Corporate Bureau of The Wall Street Journal, and is ashamed it took him so long to update his bio. In April 2010, the Journal picked up Ante as an off-season free agent signing from BusinessWeek, where he plied his trade for the last ten years. Previously he was an associate editor and department editor at BusinessWeek. Before joining BusinessWeek in February, 2000, he was a staff reporter for TheStreet.com. Prior to that, he was a contributing writer at Wired News, a columnist for Business 2.0, and a producer for the Netscape NetCenter. Ante was also a founding associate editor of The Web Magazine. Ante received a bachelor’s degree from Indiana University’s Kelley School of Business and a master’s in journalism from the University of California at Berkeley. His 2006 investigative story exposing the identities and photos of the world’s most dangerous cybercriminals, “Meet the Hackers,” won the 2007 Deadline Club award for Best Science, Technology, Medical and Environmental Reporting from the New York City chapter of the Society of Professional Journalists. His 2005 story revealing problems with the private training of Iraqi security forces, “A Hole in Bush’s Exit Strategy,” won the 2006 Silver Award for Best Original Web Feature from the American Society of Business Publication Editors. His 2004 story on the decline of high-skilled immigration, “Keeping Out the Wrong People,” was nominated for a 2005 Deadline Club Award. Over the years, Ante has also written for The New York Times, Wired, Men’s Journal, Salon, SPIN, Business 2.0, San Francisco Chronicle, and other places. He can be reached at bpcbowler@yahoo.com. I’m the editor of Venture Capital Journal. 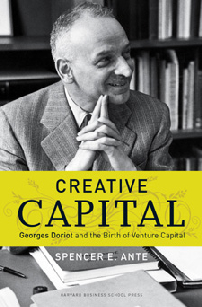 Any interest in running an excerpt of Creative Capital or writing an original column about Doriot for VCJ? I am recovering from a painful surgery and have just finished your book Creative Capital. Fantastic, absolutely fantastic. I am intrigued by the VC world and your book is the first I have read about the industry and I am glad it was the first b/c it will make a solid foundation. Thank you for making my recovery bearable. Thanks for your insights about social media during your presentation at the recent PRSA Digital Conference. I launched a web site, http://www.goodnewsforpets.com in 2000. Pets.com crashed soon after and is often cited as an example of hubris in the first Internet bubble. Not so sure it was the category. Our web site is still cooking along and social media played a role. I look forward to reading the book. Spencer – your recent artilce in Business Week is outstanding! I think there is even more to this story. Your article is a great introduction to the book I published last month http://www.Early-Exits.com. I’d be pleased to send you a copy if you are interested. Also happy to exchange ideas on a follow on story. I have been working on a tech start-up for 4 years that could be considered a disruptive innovation and have not been able to find funding. Nobody I have shared it with has had anything bad to say about it… not a single nay-sayer. I need help in making it happen and I am not greedy. Could you help with a direction or drop a name for me? Congrats on your new gig at The Wall Street Journal as NY deputy bureau chief! Let’s have lunch to celebrate! Update your bio, man! Brag on your great new job! but I do not know what operating system this guy is using.